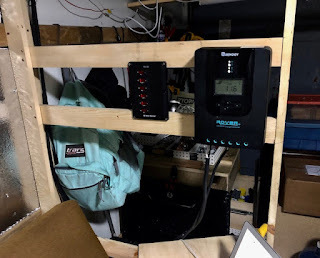 In preparation of running the 12-volt DC lines, yesterday I mounted my West Marine distribution panel. 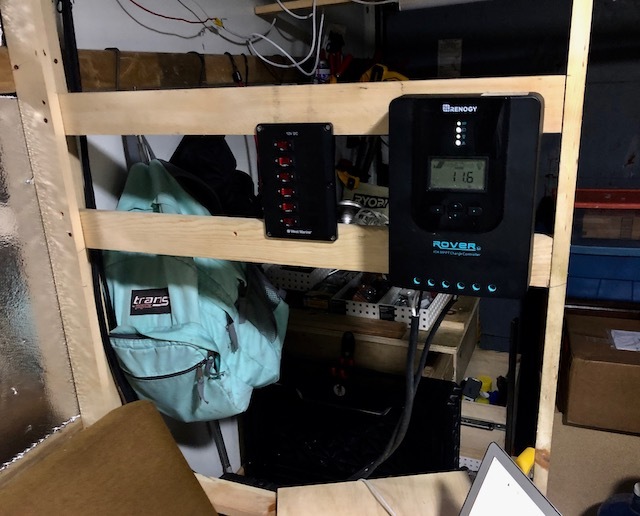 Also, I mounted the Renogy 40 amp battery charge controller on the same wall frame. On the kitchen counter side of my living quarters, I need to send 12-volts to the water pump, Nova Kool refrigerator and under cabinet lighting. Also, 120-volt AC to the microwave oven. because it is very rainy this morning. Box Van's roof is in pretty good condition. However, lately, it has been rainy around here for several days. Some rainwater does come inside! You might be able to patch up those leaks with some Eternabond tape. I do not know the location of the leaks. How do you keep air circulating and rid of odors? You have cooking, bathroom, body, and new stuff odors permeating a small space. So far, no problems with odors. If odors are ever a problem, I'll attend to it then. Hi George, I dont recall, did you install a fantastic fan in roof ? not necessarily for odors but to move hot air from inside up and out. I have one in my Roadtrek and its very useful. On another note, you say you're not installing any windows, what are your fire escape plans ? rear roll up door ? how about if you need to lock it for security reasons? a fire in the cab area leaves you only the rear door for escape. I gather you have installed a inside door release so you can raise the door ? do you have any fire extinguishers on hand ? I have not done any planning for escape in the case of a fire at nite.